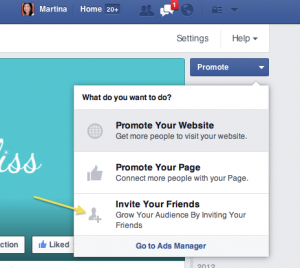 As a small business on Facebook, you want more likes and reach for your page. One strategy that you may have noticed in your account is the ability to ask your friends to like your page. Just click on the blue “Promote” button in the right hand corner of your page and select “Invite Your Friends” which will then bring up a list of your friends. You can invite them with a click. It used to be that this feature on Facebook was fraught with glitches and that it didn’t work all the time, but it has since been improved and from what I know, works very well now. (If you have had any experiences with this feature either working or not, would love to hear from you in the comments!). Feel weird about doing it? It really is a common feature on Facebook and getting invited to like pages is part of the game. In this busy, hyper connected world, it’s hard to keep on top of everything going on. You live and breathe your small business, but that’s your world. Your friends and connections (more likely than not) will want to support you and your page, but they might not even be aware of it. This little nudge gets them to take notice. Being the small biz cheerleader I am, I’m always more than happy to show my support with a “like.” I know that I appreciate being asked to like pages – this request ensures that my attention is drawn to a page that I may have otherwise missed with busy schedules and digital clutter. Not all of us are super comfortable with promoting our business via our personal profiles. One way to approach this is to only select those friends with whom we have a closer relationship, whether business or personal. If you haven’t been in touch with the person for years or you just don’t know them that well, skip the invite if it feels awkward. You could also take the approach of posting your page link to your personal profile and asking friends to like you this way. But as we know with Facebook reach, not that many of your friends will necessarily see this update. And of course, as I always say with marketing, if it doesn’t feel good, don’t do it. On to you. Have you asked your friends to like your Facebook page? Or do you keep business and personal separate? Meet you in the comments. Personally, I don’t really have a Facebook Like page for my own business, but I have several Facebook pages for different parts of my worklife, e.g., podcasting. I have been asking my friends to like these pages. I recently started a site for street food culture together with some business partners, and we have asked our friends to like our Facebook presence. Martina: Thanks for your positive comment! 🙂 Do you have food trucks in your area? Previous post: What images can I use online?